The beliefs of a community or society are expressed as truths that make up the cosmovision of a people. They are codes, rules or assumptions that mold our minds about how to produce, govern, or live; they trap and limit movement. In the work of innovation with youth and rural leaders we found dozens of beliefs, among them religious ones, that have an immense power to block innovative initiatives. How can these myths be overcome, and have instead God as a support to the people who innovate? This article deals with this issue. 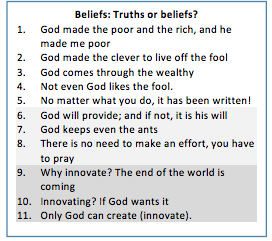 In accordance with the attached Table, people believe that “God” made them poor and stupid- like the families with material riches believe that God made them rich and “clever” (not “stupid”); they conceive of a God who creates inequality, and that the life of each person is already predestined. Under this mentality that produces victims and external culprits, the spaces are closed for innovating. These codes in the minds of people appear as sacred truths, which is why daring to innovate could be understood as a sin, because “only God can create”. Both studies reveal different perspectives about two types of religions, at the same time that they show common points coherent with the above mentality “written down” through the beliefs. We observe no awareness about inequality, the realities appear to be generated by natural (divine) causes and by individual attitudes – charity and closeness to Christ – and the change (innovation) is determined externally. Note that this perspective is similar to neoliberal fundamentalism: let the market (“the invisible hand”, like the Holy Spirit) guide society in a reality where inequality does not appear and where there are only individuals seeking profit. It is a logic that affects above all the majority of the population, while the “middle class” and the rich families assume a God (“the market” the large capital enterprises would say) that gives them prosperity, “an entrepreneurial spirit” and the capacity to give “charity”. The “mental cup” of our societies is full of this providential framework, incrusted in institutions and cemented into the depth of the soul, whose questioning is prohibited, which is why the possibilities for societal innovation spill out like the “tea”. How can we work on them? The advice of the teacher was, “if you want to learn, first you must empty what you have in your mental cup.” In other words, un-learning in order to learn, which assumes that each person and society is co-responsible for their realities, including the beliefs. The key is to have an effect from within on two complementary manners, through religion itself, and the other way is by making the beliefs controversial. The former involves analyzing the Bible in a shared fashion with the potential innovators, with the support of educators that theologically do discernment on the scriptures, providing a different (critical) vision to that expressed by the 11 beliefs, with a proactive Gospel passage like the Sermon on the Mount, even taking up M. Weber again (“The protestant ethic and the spirit of capitalism”), that it is the orderly, meticulous and thrifty life that provides the reasoning for methodically managing and organizing a business or an organization. In the latter, understanding innovation as a cognitive process, of making the reality controversial: “Juancho says I am fine, while he is in the jaws of an alligator”; the need to improve emerges in mentally producing the crisis that he is not doing “so good”, and that this improvement is a collective process (of groups, networks). Correspondingly we look into the origins of the 11 beliefs, and we clarify in dialogue what underlies those beliefs: a God of inequality and of injustice, with human beings as puppets whose destiny was defined before they were born, passive people, victims and servile people, and a God who dispossesses them of their capacity to innovate; in the case of the ants, we find that they are not kept by anyone, they live through organized effort and work. Through this process the “mental cup” is emptied a bit, with the challenge being to provide criteria with which to cultivate a contingent awareness: that situations are generated by human actions, they are changeable, people write their own lives (“free will”), and that at the same time humanity does not control everything, as T. Namiki says, believing in God is necessary…in an unpredictable world we all need to depend on something. This is when the innovation begins. This path, nevertheless, is full of obstacles. Old Marx said that ideas are materialized; the 10 beliefs paralyze innovative actions, making people believe that innovating is divine work or the work of the market. Innovating is “swimming against that current”; in fact, that is how humanity advances. Socrates 2400 years ago was condemned to death by the system that did not put up with being questioned – the question is more important than the answers. Cardinal De Cusa in the XV Century questioned the geocentric model of the universe and with that the idea that God was in the center of the universe. J Fichte in the XVIII Century questioned the universities for being “secondary schools” where the professors would repeat what the books said instead of introducing innovative ideas, for which he was fired from the University. The list continues up to our times. The priest Ignacio Ellacuría envisioned a change for humanity 25 years ago, “take down the crucified people from the cross”, and he was murdered. In our case the “cross” are these beliefs maintained by religious and neoliberal fundamentalism. Innovating starts from within people in a dialectical relationship with social change; it is un-learning, cultivating a contingent awareness, questioning, coming down from the cross and believing in a God of justice. René Mendoza has a PhD in development studies, is a collaborator of the Winds of Peace Foundation (http://peacewinds.org/research/), an associate researcher of IOB-University of Antwerp (Belgium) and of the Research and Development Institute, Nitlapan-UCA (Nicaragua). rmvidaurre@gmail.com Edgar Fernández is also a collaborator of the Winds of Peace Foundation. We are grateful to the theologian J. Arguello and Jorge Wills, a Methodist pastor, for their comments on the draft of this article.